Structural adhesive tapes have ability to fix dissimilar materials that has high load bearing capability. It has excellent joining technology and allows for weight reduction of the product such as fabricating control panels, fastening panels, name plates and bonding sliding runners. Structural adhesive tape is proven to be substitute of mechanical fixing such as welding, screws and rivets. Growth in global structural adhesive tape market is majorly impacted by few major players i.e. 3M, Nitto Denko, Henkel AG & Co. KGaA, Sika AG. The developing countries are the major growth opportunistic regions, securing high demand for structural adhesive tapes across various industries such as construction industry, electric and electronic industry, supporting the development activities of the county such as India, Philippines, which are growing near 7.0% annually. In 2017, supply of structural adhesive tape for healthcare industry was highest in North America, for their highest contribution in healthcare and hygiene industry, which is followed by Europe. Goldstein Research analyst forecast that the global Structural adhesive tape market size is set to reach USD 8.59 billion by 2025, growing at a CAGR of 7.62% over the forecast period. Growth in allied industries, supply of raw materials, and advancement in composition among others are some of the factors inducing the growth of structural adhesive tape market. The report covers the present ground scenario and the future growth prospects of the Structural adhesive tape market for 2017-2025 along with the global sales and global revenue of structural adhesive tape. We calculated the market size and revenue share on the basis of revenue generated from major players across the globe. We have forecast the market on the basis of manufacturers, suppliers and distributors, raw material providers. On the basis of product type, double coated tape accounted for largest market share of 59.7% in 2017, on the back of its large application in various industries such as bonding, holding, mounting. Based on material, polyurethane segment is expected to grow in future at a rate of 4.1% annually. Structural adhesive tape market outlook 2017-2025, has been prepared based on an in-depth market analysis from industry experts. The report covers the competitive landscape and current position of major players in the structural adhesive tape market. The report also includes porter’s five force model, SWOT analysis, company profiling, business strategies of market players and their business models. Global structural adhesive tape market report also recognizes value chain analysis to understand the cost differentiation to provide competitive advantage to the existing and new entry players. The structural adhesive tape market has a trend of its wide application across various industries that amount to consumption of around 40 billion square meter per year. Demand for tape backing materials of structural adhesive tape had grown by 21% in 2017 since 2013. Structural adhesive tape have no impact of external environment i.e. temperature and moisture, which has boosted the demand for structural adhesive tape. 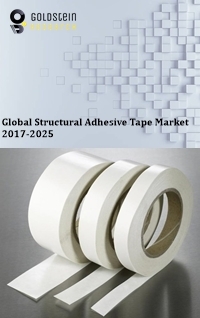 The growth of manufacturing industry, construction industry, furniture and hardware industry, electric and electronic industry among others are the major drivers in the growth of global structural adhesive tape market. The availability of raw material poses greater challenge for structural adhesive tape market. Shortage in supply of raw material and price fluctuations makes the manufacturing of the structural adhesive tape difficult. Based on geography, Asia Pacific accounted for largest market share of 35.1% in 2017 of the global structural adhesive tape market. Asia-Pacific region, which accounts for the largest number of construction projects and other industries that demanding structural adhesive tapes are continuously growing within the region on account of development and urbanization activities. North America closely follows Asia-Pacific market share, as it holds the major manufacturers of structural adhesive tapes such as 3M. Global Structural adhesive tape market report comprises of the following companies as the key players in the Structural adhesive tape market: 3M, Nitto Denko, Henkel AG & Co. KGaA, Sika AG, Huntsman International LLC, Illinois Tool Works Inc., The Dow Chemical Company, Ashland, H.B. Fuller, Bostik, LORD Corporation, Lintec Corporation, Beiersdorf. What is the revenue of Structural adhesive tape market in 2016-17 and what would be the expected demand over the forecasted period?